Shop Ingo Maurer lighting at Stardust. German lighting prodigy Ingo Maurer's lamp collection blends art with lighting. He is often called "a poet of light" instilling his lamp designs with something "extra-special". High-quality, German Made, sophisticated lighting designs make up this brilliant collection of contemporary and transitional lighting options that include chandeliers, pendant lights and table lamps. Discover Ingo's Birdie Chandelier, Bulb Lamp and Campari Light. Ingo Maurer was born in 1932 in Reichenau Germany as the son of a fisherman. He completed his training as a typographer in Switzerland and Germany. Following his 4 year graphic studies from 1954 to 1958 in Munich, he emigrated to the USA in 1960, and worked as a freelance designer in both New York and San Francisco. In 1963 he returned to Munich Germany and founded the 'DESIGN M' studio in 1966. His first lamp received the name 'Bulb' and became an icon of modern design. In the late 1960s, husband and wife team, Dorothee Becker and Ingo Maurer created Uten.Silo; a multi-pocketed and very practical wall organizer which also became a huge hit. Both Bulb Uten.Silo are still available through Stardust. The goal of "making art a part of function" is expressed uncompromisingly in all of Ingo Maurer's work. His fascinating light sculptures capture the imagination and are uniquely different. Ingo Maurer is fascinated by what he calls the "magical and mystical" properties of light. Ingo Maurer constructs luminous atmospheres that play with traditional concepts of color, brightness, and shadow. German-born Ingo Maurer is one of the most prolific and respected lighting artist/designers working today. Since 1966, Ingo Maurer has created more than 150 different lights and lighting systems and designed lighting for diverse international venues, including fashion runways, public buildings and monuments, and private commissions. Ingo Maurer uses unexpected materials and found objects to create light, and he is a pioneer in the usage of new lighting technologies. The exceptional Ingo Maurer lighting collection looks fantastic in any location. Ingo Maurer lamps can often be found in fine private homes, office environments, hotels, libraries etc. Ingo Maurer's work can be found in numerous collections including The Museum of Modern Art and the Cooper-Hewitt National Design Museum in New York. Some of the most popular Ingo Maurer lamps include the Campari Lamp; a pendant lamp shaped with unopened red Italian Camparisoda bottles (imported from Italy). 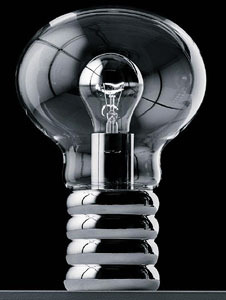 His iconic Bulb Lamp, designed in 1966, can be found in the permanent design collection of New York's MoMA. Ingo Maurer's latest design is the Johnny B. Butterfly pendant; an oversized light bulb adorned with hand-made insects including a Dragonfly and Butterflies. 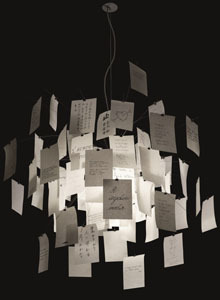 Ingo Maurer has created some of the most amazing chandeliers. Among this selection of decorative chandeliers you will find beautiful and stylish designs that incorporate an artistic flair. Combining modern influences with decorative qualities Ingo Maurer's chandeliers transform an everyday object into an ornamental light fixture. Some of the most popular Ingo Maurer chandeliers include the Birdie Chandelier; a lamp that appears to be in flight with its goose feather wrapped bulbs and the the Floatation Lamps which use Japanese rice paper as a translucent medium. Ingo Maurer's latest design is Lacrime del Pescatore; recreates glistening fishermen's nets in three layers of nylon netting literally dripping in sparkling crystals. A fitting choice for the son of a fisherman who became the world's most brilliant lighting designer. 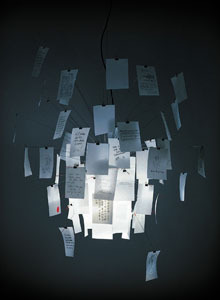 Stardust offers the Ingo Maurer lighting collection at guaranteed low pricing and free shipping. Our knowledgeable and friendly Ingo Maurer experts will be pleased to assist you with any questions you may have. We carry the popular Zettel'z 5 and Zettel'z 6 Chandeliers, Ingo Maurer Campari Light, Canned Light, Bulb, Luxury Pure Ceiling Lamp and Floatation Lamp. Most of the Ingo Maurer lamps including Birds Birds Birds and Birdie are in stock for immediate shipping.